145 miles on the bus, 3 miles on the bike. It was sort of a rest day today but I rested in motion. Considering it is the first day of autumn down here I have to start making my way north if I want to avoid the more rigorous cold that is to come. 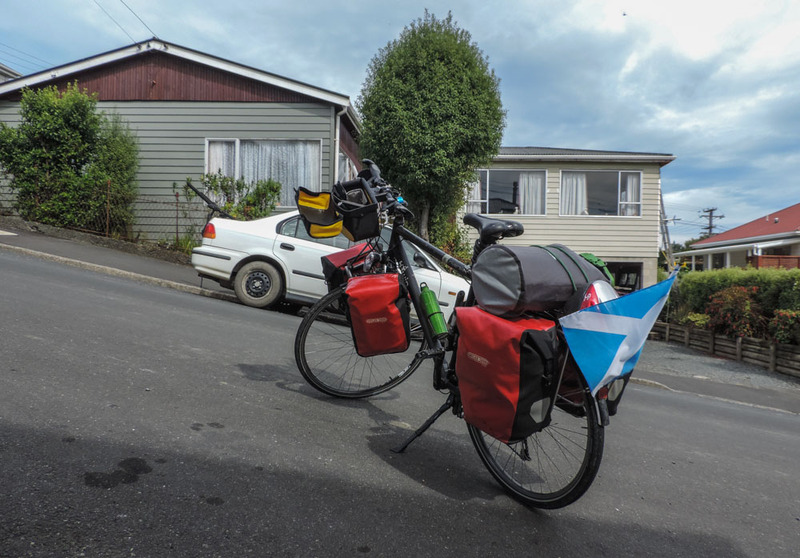 I therefore decided to avoid cycling back from Dunedin from Invercargill on the inland road that is really a lot of traffic in a small road with just sheep and cows to look at. 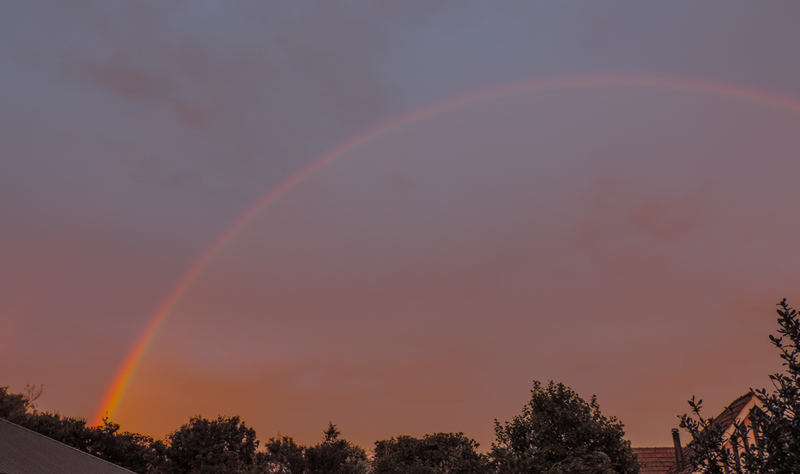 When I woke up I was instantly vindicate in my choice as the rainbow, while pretty to look like was telling me there was water in the air. I got to the bus stop and I discovered a girl to whom I had just said bye bye to at the hostel after breakfast was there too catching the same bus. 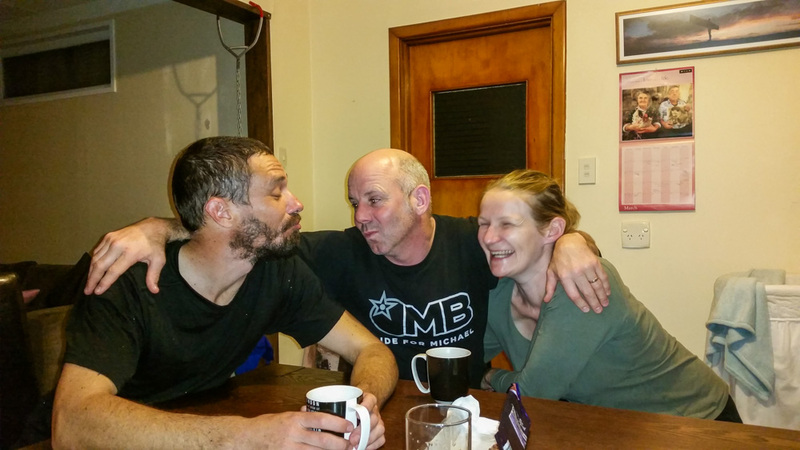 She was Caroline, a French penguin researcher that was doing a bit of traveling after a six month research posting in Wellington researching blue penguins. We traveled together and exchanged experiences of this great country, she also gave me some excellent short and long terms tips. In the short term she told me to stop in Omaru, which I will do on Tuesday night, as there is a blue penguin colony and they come in from the sea in quite a spectacular procession at dusk. The other great tip was about a sailing race they do around the north island where thy are always looking for crews, perhaps after I do the course up in Auckland, i.e. next time I come, I will look for that kind of opportunity. If I get to do something like that a few times I can then really start thinking about getting my own boat. 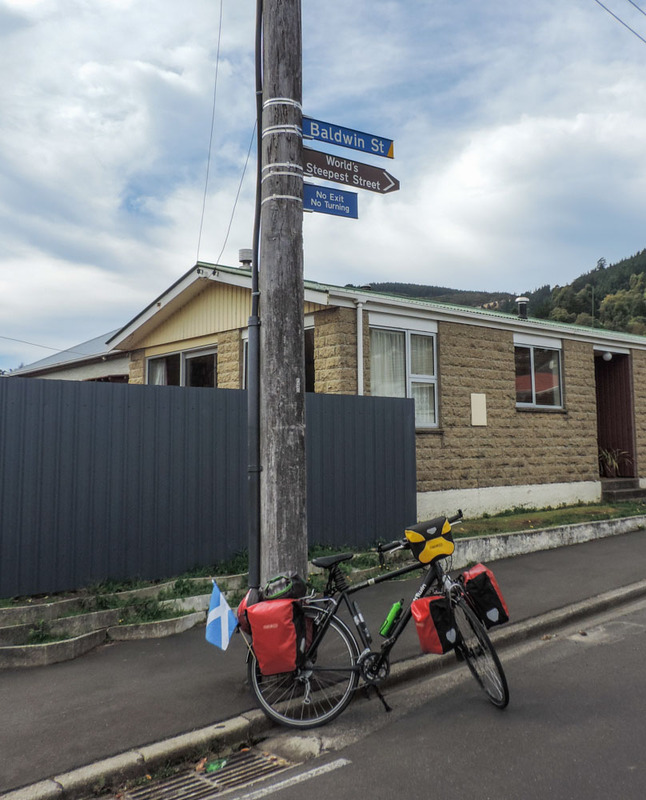 As I got to Dunedin I phoned Harry, the WarmShowers chap I met in the bike shop at the beginning of the week, and he just told me to show up when i wanted, I got a bottle of wine, naturally pinot noir, and started making my way north. Quite fortunately him and Kim, his wife, live on the road I was planning to use to exit the city tomorrow so what I did today took away from my cycle-load tomorrow. 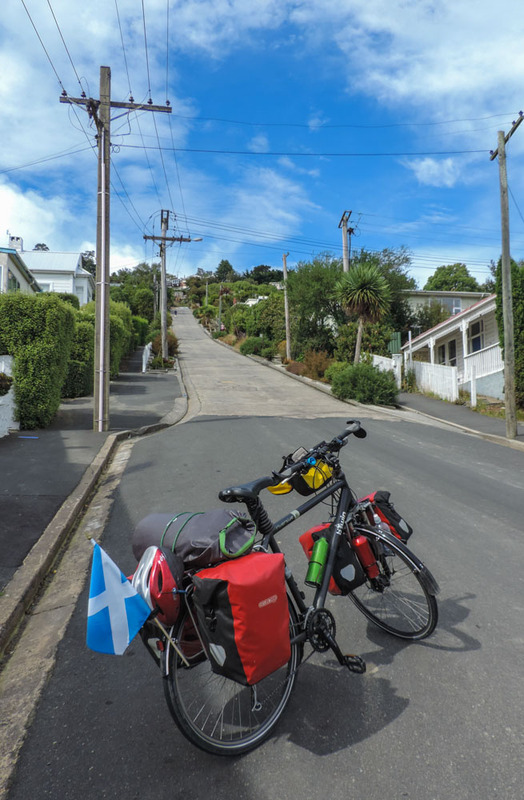 Their house is also not too far past Baldwin street (steepest residential street in the world) so I stopped and took a few pictures. There was no way I was going to make a fool of myself and try the ascent 35% in the cement part is just too much for my bicycle, with or without the panniers. This was to say I got here. It looks so scarier in the flesh. 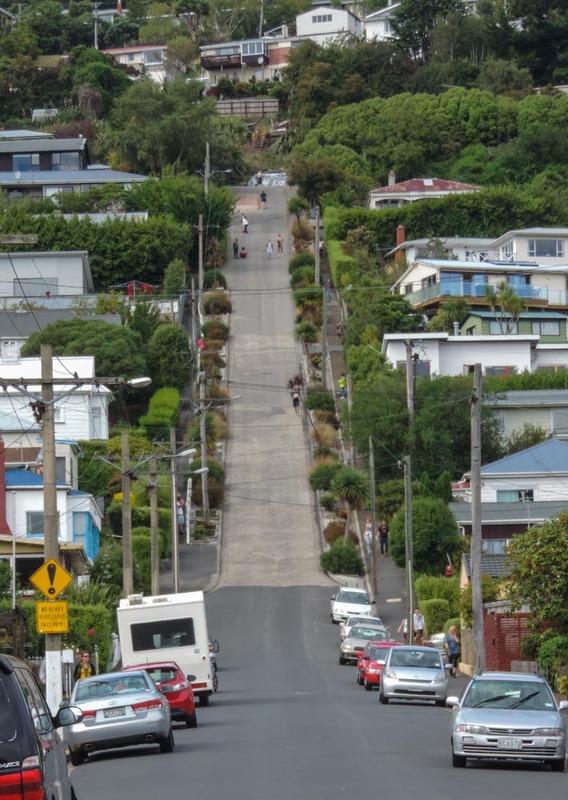 And that was not even the steepest bit. I spent a lovely afternoon with Harry and Kim and their kids. I told them my half formed plans for the next year and they told me how next January they will be leaving to go traveling on bike with they children in the trailer, now how cool is that? We had dinner together and we were joined by Kim’s dad and three of Kim’s nieces that were staying with granddad. Also after a while Spenser, another WarmShowers guest like me, came home after a day in town and we had a fabulous evening together talking bikes and traveling with a couple of glasses of wine and some lovely food. Spenser is on his way back to the States soon and he told me any time I’m in New York to just ping him and I’ll have a place to stay. Not sure when yet but north America will for sure feature on the cycle road map, who ever said New Yorkers are grumpy? 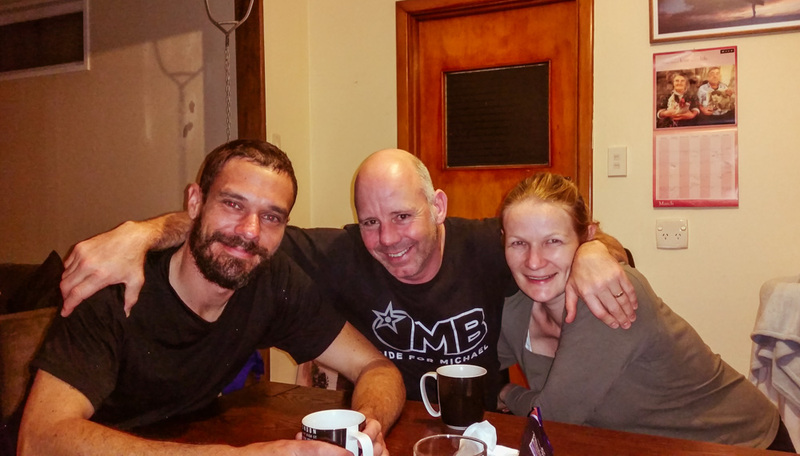 It amazes me how hospitable people can be and it is encouraging me, when I settle again to open my doors, wherever they may be to others just like these lovely people are doing for me. Next Post Fush’n chup bro? Caro Alex che begli incontri !! !